Well, it’s week 2 and counting…so I figure it’s time for a mental health check. Super challenging course load? Check. Required weekly First-Year-Experience programming for freshmen? Check. Rushing to get everything assembled for the Ampersand? Check. Schedule filling up with meetings for every day of the week? Check. Check. Check. But…Stressed beyond my imagination? Actually…not so. I’m actually impressing myself by being decently calm and collected despite the ever-growing items on my to-do list. My semester will be rough, no doubt, but so far I think I have a handle on things as long as I stay on top of everything and figure what needs to be done when. Alright, I am probably attributing this to it being syllabus week, but I didn’t actually feel like I had a “intro” week to enjoy and get eased in. All of my classes feel like they started off running right away – no time for getting settled or any forewarning. I don’t think a single one of my professors spent more than 10 minutes running through the syllabus before immediately diving into the content, which makes sense since I’m taking all more difficult classes. Usually at last half or the entire first class is dedicated to discussing the syllabus and the course, so I needed to be on my game right away this time. But all has gone well so far! I’ve been trying to be on top of it by reviewing everything we cover in class on the same evening and then getting ahead for next class too. If I can keep this up, I’m sure things will be okay…but it’s keeping it up that will be the challenge. Like I feared during the summer, I do feel rather burnt out after taking summer classes + doing research and then going straight into 2 weeks of housing training and now straight into fall semester again. Recently it feels like I’ve just had very little personal time to myself since I’m constantly surrounded by other people and have to consciously interact. I’m the kind of person who finds energy and recharges through being alone rather than with other people, so even though I love meeting all the countless new people I have lately, I’ve been pretty exhausted for the past couple of weeks. But aside from interacting with the residents on my floor, my staff, and reconnecting with my best friends on campus, I’ve actually been pretty good and trying to meet new people in classes too. One of my favorites is my Russian 201 class. The first day intimidated me greatly – mostly because I am one of the three non-native speakers in the class. Ever since Russian 102, the number of non-native speakers in my Russian classes has been dropping with each successive class as students satisfy their language requirement or find some alternative, presumably easier language to learn. I’ve always loved Russian and can’t wait to keep taking classes on my way to my language minor, but now that the class is 90% native speakers who have grown up speaking, understanding, and hearing the language at home since childhood, I’m anxious that I won’t be able to keep up. Fortunately, though, everyone in the class is so friendly, and the professor seems pretty funny and enthusiastic too. Even though a lot of people dislike language courses, I’ve always loved them, especially in college, because it feels like one of the few classes I get where the class size is small (for Russian usually only 10-15 students) and everyone is encouraged to talk and get to know each other extensively. There are some students in my class who I have known since Russian 103 and 104, so it was awesome to see some welcoming, familiar faces when I walked in on the first day. Well, I know the bulk of this post has been rather dry so far…but that’s probably because there’s not much else I’ve been up to besides work and school. 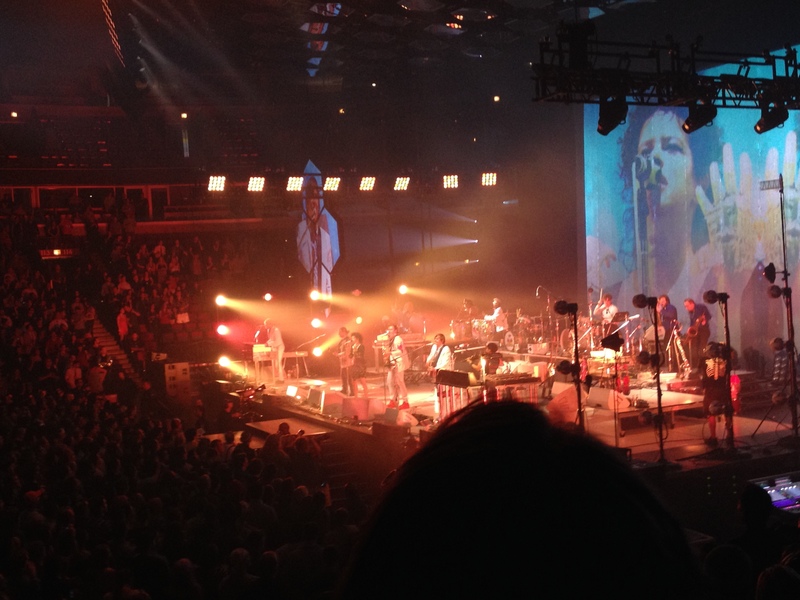 I’ll try to be more creative in the future, I promise…but in the meantime, the best I can share is that I went to an Arcade Fire concert last week! It has definitely been one of the highlights since my summer final exams ended. Brandon got us tickets and since it was at the United Center, which is so close to where I live on east campus, I couldn’t resist the opportunity to go. As someone who only knew a handful of Arcade Fire songs (and admittedly only two off their newest album), I wasn’t exactly sure what to expect, but the concert was simply incredible. The concert was part of Arcade Fire’s Reflektor Tour, and they opened with the title song, which was one of the few I knew and really loved. The lights lit up all throughout the stage, switching around the room rapidly, and it was really exciting to just feel the craze and eagerness of the crowd. Many people even dressed up in costumes or formal attire (the ticket actually said to do so!) and it was funny seeing people walk in by dressed as cartoon characters. When we arrived, Brandon and I actually had our 300 level seats upgraded to 100 level seats free of charge! I’m not entirely sure why they closed off that level, but we definitely had an awesome view of the entire concert. I had a fantastic time just enjoying the ridiculous amount of streamers, balloons, and glowing lights that surrounded the inside of the United Center – and of course the music was entrancing as well. Because there seemed to constantly be something to new pay attention to, I was on my feet nearly the whole time. My favorite performance was the one of It’s Never Over (Hey Orpheus), which had lyrics that alluded to the Greek myth. The lead singers Win and Régine were fantastic, with Régine appearing on the B stage across the main stage as they sang back and forth. I'm pretty proud of this photo I managed to take! Régine is stunning. Well…time to get some more work done if I want to stay/get caught up with eveything, even though the things to do just keep rolling in at a faster pace than I’m going at…but in between I’ll just make some time to add all the Arcade Fire albums I can find to my playlists. Hi, I'm Sarah! I am a junior Neuroscience student in GPPA Medicine who is still trying to figure out exactly what I want to do in my life. One day I want to be fluent in Russian and explore Eastern Europe. In my free time, I love running, playing piano and guitar, and reading. I currently live in Courtyard residence hall as a Peer Mentor but my home is in Naperville.